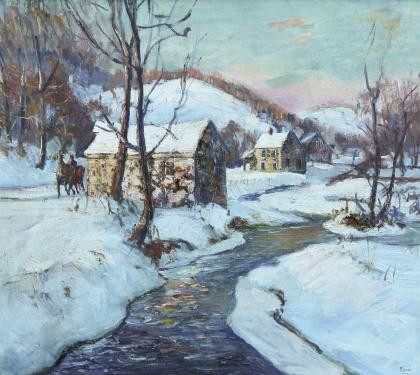 A grand winter landscape by Walter Emerson Baum. This is the most desirable form of Baum's work. A river centers the composition with subtle plays of light, nicely presented stone homes with rolling hills in the background. A horse and sleigh enters the painting from the left. It has a National Academy of Design, NY exhibition label on verson entitled "Mill". Very good condition. Has been cleaned. Dimensions: Width 36" | Height 30"